A new era of high-quality Chinese-made animations might have just begun as a Monkey King animated feature has become a cultural phenomenon since its debut on July 10. A poster of animated film "Monkey King: Hero is Back." "Monkey King: Hero is Back," directed by Tian Xiaopeng, has grossed more than 100 million yuan (US$16.11 million) in just three days. This success was hard-earned, since the film’s screenings were scheduled alongside two teen-targeted blockbusters, "Tiny Times 4" and "Forever Young," which raked in 360 million yuan (US$57.99 million) and 255 million yuan (US$41 million), respectively, over the weekend. On its opening day, “Monkey King: Hero is Back” only claimed six percent of the total screenings of all films in China. But the word-of-mouth effect worked, and as more and more fans flocked to screenings of the animated film, cinema managers rushed to add showings. On Monday, the nationwide percentage of showings for "Monkey King" had grown to 14 percent, though this is still less than the proportion of screenings given to "Tiny Times 4" and "Forever Young." "Monkey King: Hero is Back" is based on the extremely well-known legend of the Monkey King from the Chinese fantasy classic "Journey to the West," but the film tells a not-so-familiar story with new plots and designs. Though there are still many flaws in the film, and though some critics have criticized its simplicity and thin plot lines, it has already generated enthusiastic responses from audiences, especially from cartoon fan communities. The animation took eight years and cost more than US$10 million to make, and the film eventually came up short of money for further production polishing and promotional events before its opening. Now it is relying heavily on its own quality and moviegoers' rave reviews on the Internet for promotion. As of Monday, there were already 470 million tweets about the film on Chinese Twitter-like microblogging site Weibo.com. On the movie rating website Douban.com, the film has a very positive score of 8.8 out of 10, the best of all the Chinese films screened in 2015. 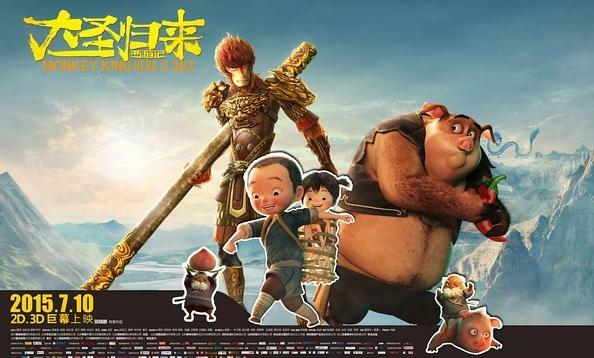 "Monkey King: Hero is Back" has also become the third Chinese animated film to gross 100 million yuan on its opening weekend, following the two "Boonie Bears" series films. Observers have estimated that the animated feature will eventually gross 300 million to 500 million yuan (US$48.33 million to US$80.55 million), a new milestone in the Chinese animation industry. The current top-grossing Chinese animation is "Boonie Bears: Mystical Winter," which grossed 295 million yuan (US$47.52 million). Unlike the "Boonie Bears" series, which was mainly targeted at young children, "Monkey King" is targeted at audiences of all ages who have grown up with the fictional superhero. The delicate scenes, smooth pace, inspiring plots and emotional storyline have touched many viewers’ hearts while many critics and celebrities have lavished the film with praise. Director Tian said in an interview with Mtime.com that the one thing he wanted to prove through this film is that the Chinese are capable of producing good animation, which will change people's misconceptions and prejudices about Chinese-produced animation. Fans of the film volunteered to recommend the film everywhere on China’s social networks since the studio has very little funding left for further promotion. Some fans have even created original artwork and made heartfelt unofficial music videos in appreciation of the movie, fueling the film’s ascension to cultural phenomenon status.